Cash is a necessity on your trip to Japan. Not sure about how much to bring? We recommend convenience store cashing services. In this article, we introduce basic information on cashing and how to do it with Seven Bank ATMs. Are you planning a trip to Japan? How do you plan on doing your shopping in Japan? Those that think the same as above should pay extra attention to this article. The reason is that Japan is the world’s leading cash-based country, resulting in credit cards and electronic money being unusable in most sightseeing spots. In this article, we’ll introduce the settlement situation in Japan for those curious and a simple method for you to obtain Japanese yen during your visit in this article. When you find yourself in trouble because you don’t have enough cash, please remember this article. According to data published by a major telecommunication company, the status of Japan’s cashless settlement is 18.4% and remains at quite a low level when compared to other countries. You will surely run into situations where you will be unable to pay if you intend to only bring your credit cards on your trip. What is the Necessary Travel Expenditure for Japan? Next, let’s take a look at the typical amount of necessary expenditures on a trip to Japan. According to JNTO’s (Japan National Tourism Organization) statistics, an average of about 150,000 yen (~1,340 US dollars) is necessary per person on a trip to Japan. It is most probable that a portion of this amount are transactions that can only be made in cash. What Situations Do You Need Cash In? Now then, in what sort of situations and settings do cash-only transactions take place? The below table is a summary of popular tourist activities that require cash payment. Fish Markets Japan’s fish markets, such as the Tsukiji Market, are the place to enjoy trying foods from various vendors. Be careful as many vendors do not accept credit cards. Flea Markets Cash payments are also customary at flea markets where you can find adorable items. Even if you find a bargain, someone else might buy it instead if you don’t have cash. Local Railways Local railways popular amongst tourists, such as the Isumi or Choshi Railways, require tickets purchased from cash-only ticket machines. Shrines and Temples Payments for entrance fees, luck-divining papers, and other such items at shrines and temples are customarily made only in cash. The autumn leaves season and special evening visiting periods are when admission fees tend to increase, so it would be safer to have money to spare in your wallet. Private Lodgings and Restaurants Privately owned lodgings and restaurants are where you can enjoy the atmosphere and communicating with the locals. They often only accept cash. Recharging Transportation IC Cards Transportation IC cards such as Suica or PASMO can only be recharged with cash or with specific Japan-issued credit cards. Now then, how should you obtain cash for your Japan travels? There are various places where you can acquire Japanese yen. These include the exchange offices in your home country before your departure, the currency exchange counter in the airport after arriving, or the banks located in sightseeing areas. However, MATCHA recommends convenience store cashing. One of the reasons we recommend this service is due to its simple process of “just inserting your credit card into the ATM at the convenience store and following the directions.” However, that isn’t the only appeal to using convenience store cashing. Compared to other countries, Japan has very few currency exchange counters. It can also be a waste of time searching for a currency exchange counter when trying to exchange your currency in sightseeing areas. On the other hand, the number of convenience stores total over 55,000 stores as of 2018 (source: Japan Franchise Association). It is almost certain that you can find a convenience store in most stations and sightseeing areas. You won’t have to worry about searching around for a place to withdraw money! There are surely persons who think like this. However, walking around with a large amount of cash is not recommended, even in a country as safe as Japan. You will decrease the worries of having a large sum of money stolen from you by using convenience store cashing. The amount of cash that you actually require is something you won’t know until you’re in Japan. When you have cash remaining from your trip, you will need to re-exchange your money when you return to your country. This results in paying for unnecessary handling fees. By using convenience store cashing services, you can withdraw only the amount you deem necessary after arriving in Japan. If you’ll be utilizing convenience store cashing services in Japan, then our top recommendation are Seven Bank ATMs. 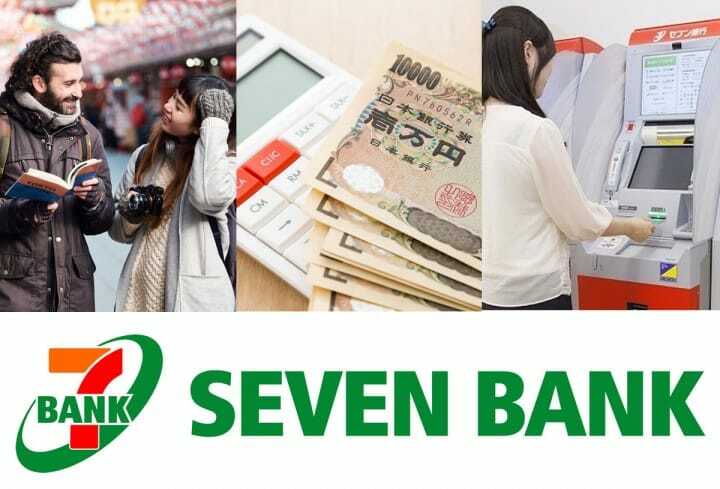 Seven Bank is a bank affiliated with the world-famous 7-Eleven convenience store chain. These ATMs are found in 7-Eleven stores. Out of several ATM options, why do we recommend Seven Bank ATMs? Withdrawing Japanese yen can generally be done 24 hours a day, 365 days a year regardless of day or night. ** Business hours will vary by store. Complete Support for Cards Issued Overseas! Seven Bank ATMs also support credit cards issued overseas. The card brands that can be used to withdraw Japanese yen are listed below. You can easily obtain cash even with the credit cards you own as long as you have one of these cards. Please check what credit card brands you own before your departure. Seven Bank ATMs offer their operation guide in multiple languages. You can choose from English, Chinese (Simplified or Traditional), French, German, Portuguese, Korean, Thai, Malay, Indonesian, and Vietnamese. The way Seven Bank ATMs are used isn’t much different from the ATMs that you typically use. The language selection screen will be displayed once you insert your card, so just follow the directions to withdraw your money. For details, please check Seven Bank’s official website (https://www.sevenbank.co.jp/english/). Make the Best of Convenience Store Cashing! You won’t be able to fully enjoy your long-awaited Japan trip if you don’t have enough cash when it’s necessary. If by any chance you find yourself short of cash, then try using the cash services at Seven Bank ATMs. Be sure to check the official website before departing your country if you plan on using the ATMs! Kyoto Complete Guide: Travel Tips, Sightseeing, Festivals And More! Saitama Travel Guide: 35 Sightseeing Spots, Food, Shopping And More! Nikko Pass Trip Day 2 - Discover The World Heritage Sites Of Nikko! Toshio Suzuki and Studio Ghibli Exhibition - Yubaba Is Back!